March means the clock is ticking and my students are beginning to feel the pressure of getting ready to take standardized exams. 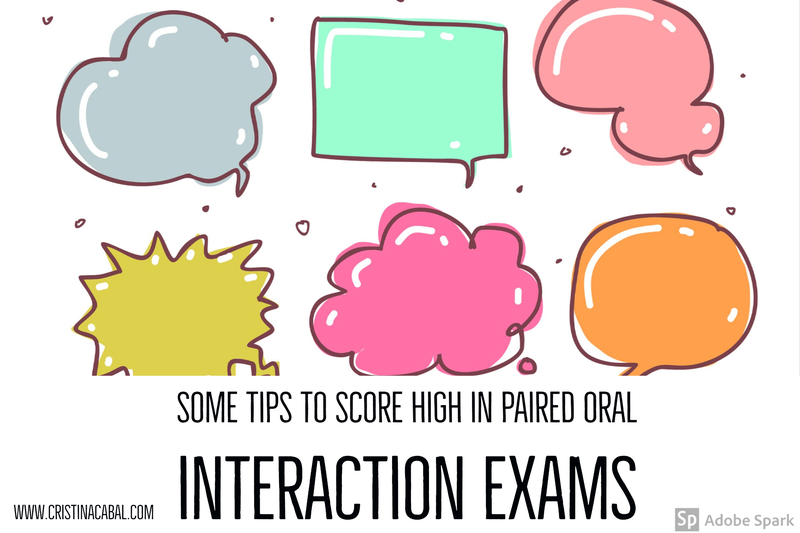 Not an easy thing to do when it comes to taking oral exams and the pressure and the tension can sometimes be overwhelming. In this part, two or three candidates will be asked to speak together. The examiner will give you a task and there will be some prompts to talk about. You’ll need to express your own opinion and also ask for your partner’s opinion, you will need to share ideas and interact discussing some of the points written on your worksheet. You’ll have 1 or 2 minutes to look at the task, but you won’t be able to take notes. Your conversation should last about 5 or 6 minutes. 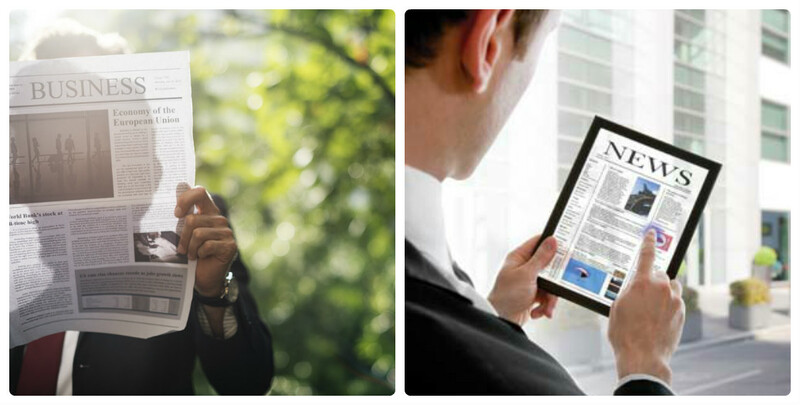 You need to perform well in terms of Interactive Communication. 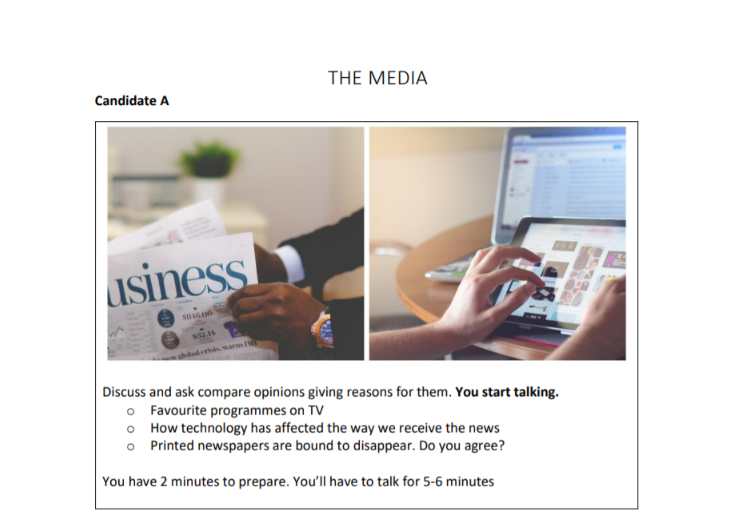 You need to ask questions, ask for opinion, suggest…etc and link your contribution to what the other candidate has said. This is an interaction between two or three students, so you might want to think of the questions you want to ask your partner to ask for his opinion or preference. Remember that this is not a monologue. You should speak and address your partner, not the examiner. If you make a mistake, correct it. Obviously, it’s better not to make any mistakes but if you do, correct it and carry on talking. Remember this is not a listening exam, it is a speaking exam. Speak as much as possible when it’s appropriate. Be sensitive to turn-taking. The other candidate has to speak too. You need to find a balance between speaking too little and too much. There are no right or wrong opinions. We are assessing language here. Don’t forget that it is important to use a wide variety of structures. Don’t just talk about a single idea. You won’t probably have to talk about all the points suggested in the worksheet, but you should not focus on only one. You need to move from one idea to another. Remember your pronunciation should always be intelligible. Make sure you take every opportunity to speak. If you are not sure what to do, ask for clarification. Learn long answers or speeches by heart. Don’t leave long or frequent pauses. Don’t give short answers or one-word answers. Elaborate on your ideas. Don’t talk to the examiner. Talk to the other candidate. Asking for opinion: what do you think about …? What are your thoughts on…? What about you? How about you? Do you agree? Suggestions: How about moving on to….? Let’s discuss a different one now. Let’s talk about the advantages now. Video of a mock exam explaining what to do and not to do in an oral interaction exam. I am a huge fan of Simple English Videos and I have found this one below that might give you an idea or what to do and what not to do in the exam. It’s Monday. I swear it was Friday when I last blinked. 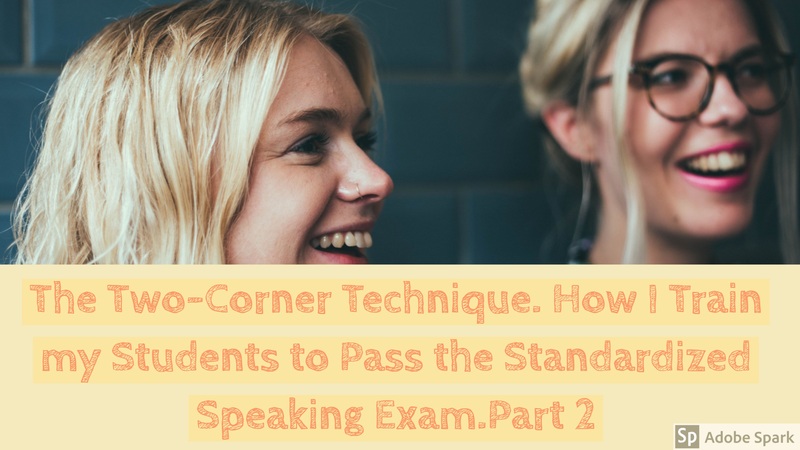 Exam time is inching closer and closer and I figure it’s about time I share part 2 of how I prepare my students to take oral exams. Please, note that attending classes and piling up dozens of photocopies helps, but this alone does not guarantee you are going to pass the exam. Practice. Keyword here. In Part 2, you are going to read about the two-corner technique and the websites I use to help my students gather ideas. What I am going to relate here is one of the reasons why I try to offer my students not only vocabulary and structures but also ideas. Yes, I present them with different ideas, but I don’t ask them to study and use them as if they were theirs, I ask them to discuss them. Why? Mainly because by discussing ideas they can develop their own, acquire some others and also learn to challenge opinions they do not agree with. You have probably heard students, or experience if you are one, talk about this fear of not knowing what to say. Only last week I set a writing activity to be done in class. I asked students to write for about 20 minutes giving their opinion about a topic we had already discussed in class. I observed one of my students was not writing but staring into space. After 5 minutes, I approached him and asked why he wasn’t writing. He said he could not come up with any ideas, said he wasn’t inspired and that he was afraid this would happen on the day of the exam. And I worry. Even though my students study hard, sometimes they find it hard to think on their feet and start talking or writing. It’s with this in mind that I try to provide my students not only with grammar and vocabulary but also with other people’s points of view on a given topic so that they can discuss these ideas and develop their own arguments. Speaking is not only talking about what you would do but also about what you wouldn’t do. Step 1. Brainstorming vocabulary. As usual, we brainstorm vocabulary on the board. This is a necessary step as you don’t want students to get stuck because they can’t come up with a term. Step 2. Posing the question. I write on the board ht e big question. In this case: What do you prefer? 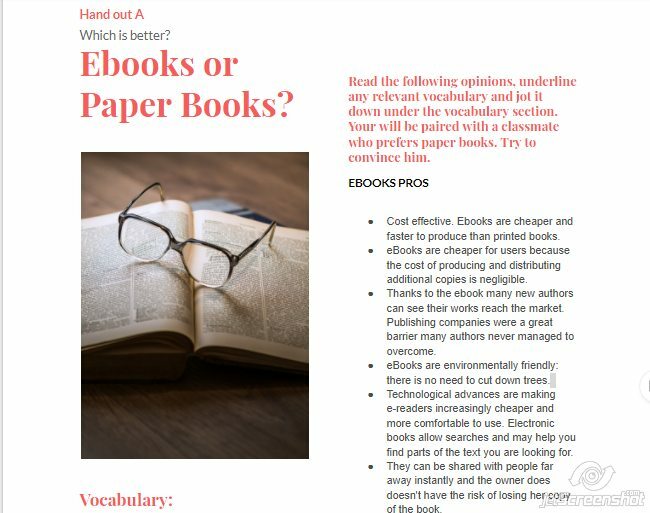 Ebooks or paper books? Step 3. Using the two-corner teaching technique. This technique is actually called the four- corner technique, but I find a two-corner approach suits my classes better. With this technique, you get your students out of their seats and thinking about the topic they are going to discuss. In one corner of the classroom, I put up a notice saying paper books and in another corner a notice with ebooks written on it. I ask students, still in their seats, to think which corner of the room they would choose and think of the reasons why they prefer one choice to another. After a bit of thinking time, I ask them to stand up and go to their corner of the room. Once there, they talk to the members of their group sharing ideas and talking about why they favour one choice and not the other. Step 4. Getting ideas from other sources. Time to see how others express your same idea and maybe get some others. Give students in favour of ebooks handout A and give handout B to students who prefer paper books. Let them read it and comment it in their groups. This is the part I like best. Pair up students from both corners. Their aim will be to campaign on behalf of their choice and try to convince a student from the opposite corner to flip sides. For this activity, I have used the website https://netivist.org/ , which is a platform where users can debate and engage in thoughtful discussion sharing different points of view. 2. Students listen to what other people have to say on the subject. 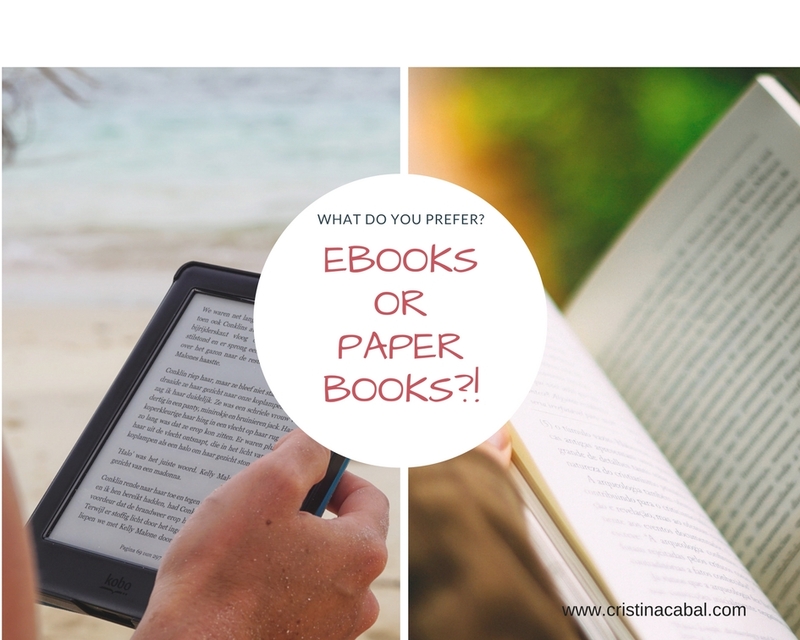 Ebooks VS Printed Books: Which Is Preferred?